and a free e-course on making doodlenotes. I’m posting the notes from Bootcamp for fellow creatives and as a reminder that free content is NEVER free, and artists are often working hard to hustle the resources needed to create. The internet allows us to consume art with no cost, but artists always pay a price to create- in time, in supplies, and in their vulnerability. 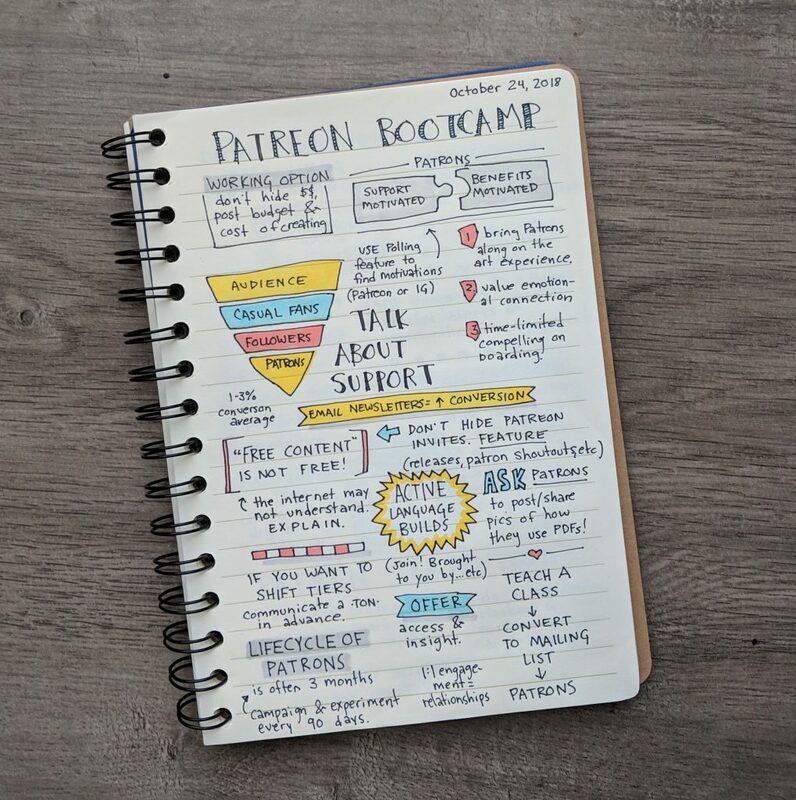 I hope you all love the content I post free, and I hope that one day you might sign on for a season of being a patron to help keep it coming. Although it’s a bit out of my typical genre, I’m posting these notes because I believe in “open source art.” I.e. everyone should have access to resources to create (which is why I publish tutorials after developing a new technique instead of keeping methods secret). Many of us grew up with a scarcity mindset- or were indoctrinated into it by politics. When we believe “there is not enough for me” we limit the resources we offer to others. Relationally, this leads to emotional shutdown and cutoff. Financially, it leads to economic slumps. And artistically it creates stagnation of imagination and a hostile environment where creativity cannot grow. 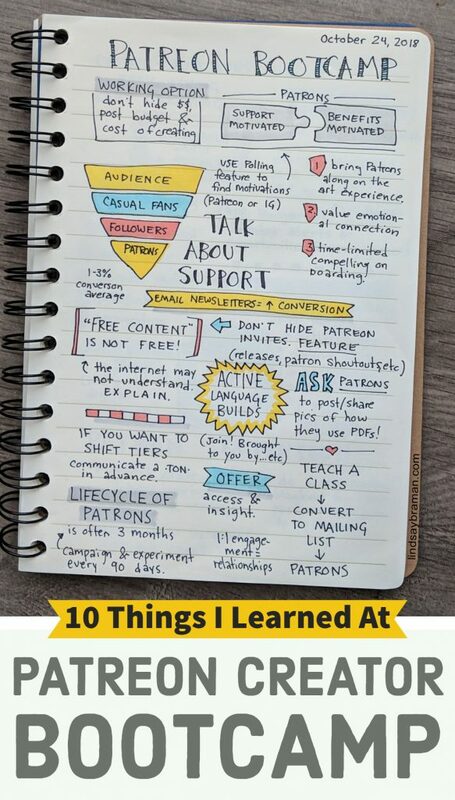 Because I care about nurturing community where artists thrive and support one another through various resources (I’ve loved adopting new creators through Patreon as my own support has grown) I wanted to post my sketchnotes to help other creatives build a supportive fan base. 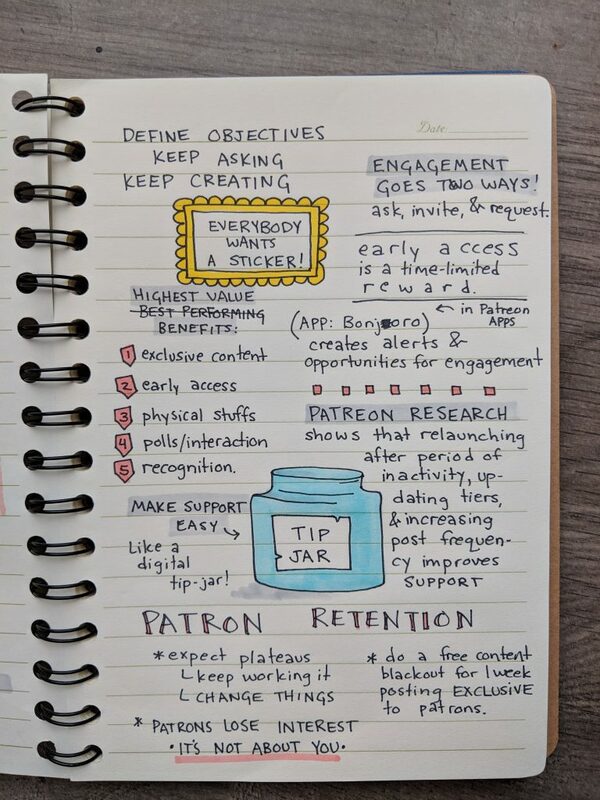 At the Patreon Bootcamp, a team of staff members from Patreon (based in San Fransisco) hosted a 2 hour “bootcamp” for 20 or so of Seattle’s Patreon creators. I lucked out- as the event booked-up almost immediately and, as luck would have it, was being hosted less than a block from my apartment! Initially planning to just swing by on the way home from picking up my CSA at Pike Place Market and sneak out if it was underwhelming, I was thrilled to find (even as a life-long artist and 20-year-alum of e-commerce and digital marketing) the teaching was really valuable. Although my just-on-time arrival meant I missed a seat at the table, these sketchnotes created on my lap turned out pretty ok!